Indigenous evaluators, and evaluators who position themselves in the transformative paradigm, share a common interest in positive transformation for those who experience discrimination and oppression. The determination of strategies for exploring how evaluators can contribute to positive transformation is complex territory. In this article we explore the common ground and divergent beliefs of indigenous and transformative evaluators in terms of assumptions about the nature of ethics, reality, relationships and knowledge, and methodologies. Transformative evaluators provide a pathway to explore inclusion of indigenous communities in their full heterogeneity as a way to respect multiple cultural identities. 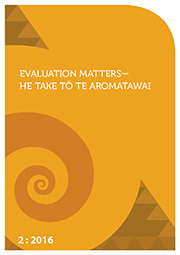 Indigenous evaluators provide a pathway to explore aspects of culture that are related to the meaning of transformation within this specific context, spirituality and historical oppression. While not always a comfortable fit, this article reveals possibilities for evaluators to improve their responsiveness to marginalised communities’ needs in their full diversity and to respect the multiple cultural positions that rest therein while working for positive transformation.